Arbin offers ultra-high precision charge/discharge testing systems for meaningful coulombic efficiency testing on cells up to 200A. Low current HPT systems are also available. Arbin Instruments, Ford Motor Company and Sandia National Lab partnered together on an ARPA-E project beginning in 2012 to develop a high-precision, high-power battery tester. This new “HPT” system allows users to more clearly see degradation mechanisms on a full-scale (high capacity) cell under real-world conditions. The project goal was to develop a testing system capable of 50ppm coulombic efficiency precision at up to 200A. This project concluded in 2015 with Arbin’s successful commercialization of the new HPT product series. HPT systems have been used by leading industry partners since 2014 during the ARPA-E project evaluation period, but only became available to the general public in 2016. What sets the Arbin HPT apart from other high-precision testers is the power level. Achieving 50ppm CE precision above ~2A required a tremendous amount of R&D and technological advancement. Arbin offers HPT systems at 100mA, 1A, 5A, 50A, and 200A. All Arbin testing systems come with a PC preloaded with our MITS 7 and Data Watcher software for creating test profiles, real‐time data monitoring, and data plotting & analysis. Battery Connections – A variety of battery holders are available for coincells, cylindrical cells, flat/pouch cells, and more. Shunt – high-precision shunt may be used for calibration of your Arbin system. Electrified vehicles require high power (20-200 kilowatts) batteries capable of performing reliably over the many thousands of cycles during the 10-year expected life of an automobile. Likewise, emerging off-grid and distributed-grid renewable energy technologies require high power batteries that perform reliably for 20-30 years or more. Very small per-cycle degradation rates enable long-life batteries to achieve decades of performance. But these small decay increments are also difficult to measure precisely and reliably. Telltale electrochemical signals that would forecast a battery’s performance many years down the road can be lost in the noise of imprecise testing equipment. Even small margins of measurement error during the early stages of performance testing can extrapolate to very large margins of error when forecasting performance over a period of decades. This leads developers of long life batteries to test for extended time periods. Consequently, experimental validation of a new battery design can require three years or more. For these reasons, battery innovation has not kept pace with increasing demand for (and decreasing costs of) green energy. Batteries are among the electrified vehicle components with the longest development cycle times, and they remain a major bottleneck for distributed energy storage applications as well. Extended testing protocols also inhibit innovation by limiting the number of approaches developers can try – and the risks they can take – in design. A worldwide race is under way to develop reliable, long-life batteries for both vehicle and stationary applications, and precision battery testing has been recognized as a critical enabler for improving the performance of long-life batteries. The High Precision Battery Testers (HPT) developed by Arbin Instruments, Ford Motor Company, Sandia National Laboratories, and Montana Tech improves the precision of high current battery test equipment by a factor of 10 for current and voltage. Commercialized as the Arbin High Precision Coulomb Efficiency Tester (HPT-200A), this technology has the ability to conduct high precision, high current (200A) tests on batteries or capacitors with voltage precision of 25 ppm and current precision reaching below 40 ppm. This significantly reduces the margin of uncertainty when extrapolating out to many years or many thousands of cycles and it can dramatically reduce the number of cycles needed to forecast material or cell performance. This improved testing fidelity also allows battery developers to avoid the use of artificial accelerated lifecycle testing protocols in which batteries are rapidly discharged and recharged many times to compress in time the effects of use-related aging. Overly aggressive test patterns that attempt to accelerate fade are potentially flawed because they alter battery performance in unrealistic ways. By supporting more realistic calendar-life use profiles, the HPT allows researchers to see, for the first time, minute trends and nuances in their data that signal the beginning of battery degradation, and to screen out less promising materials. This can significantly shorten battery development time, allowing researchers to innovate faster to meet the urgent demand for better, longer-life, high power batteries. The Arbin HPT is the highest power high precision tester on the market at 200 Amps, an amperage relevant for electrified vehicle and grid storage applications. Arbin also offers 50 Amp, 5 Amp, and 1 Amp models with better precision and better accuracy than known competing technologies at these current levels. 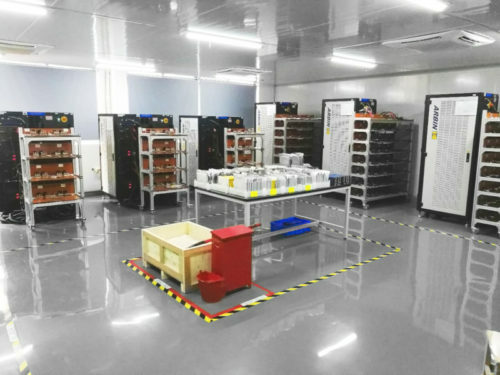 The HPT’s analytical and research applications include battery, capacitor, and half-cell testing; materials testing; quality control for materials; and sampling of battery products for reliability. The HPT was developed under a three-year ARPA-E cooperative agreement with the U.S. Department of Energy. The project began after Ford and Sandia independently approached Arbin with a need for improved testing precision for long-life lithium ion batteries, which encouraged Arbin to examine the market potential. The development process leveraged the research strengths of each of the partners. Sandia provided expertise and capability in metrology and precision calibration, as well as in distributed grid energy storage engineering. Ford provided a direct link to electrified vehicle applications and industrial battery testing protocols. Arbin developed the technology with a focus on commercial use by its customers in both commercial and R&D testing environments. Montana Tech precisely analyzed battery-testing data, leading to optimal engineering designs. Over the course of development, three first-generation and four second-generation tester prototypes were built and deployed at Arbin, Ford, Sandia and other industry partners. The systems are now commercially available to the general public. The development yielded multiple US patents allowing for highly precise signal amplification and measurement.